Kelp Greenlings are some of the most colourful fish in the Pacific Northwest and the eggs they lay are just as brilliantly coloured as they are. These greenlings are gender specific in their colouration. Females are bright yellow, and blue with a very unique pattern along their bodies, where males are various shades blue and silver. During mating season the males face and head turn a very dark blue almost black. The colours progressively intensify as courtship progress. Kelp Greenlings are one of the only species of fish in these temperate waters who have this gender specific colouration. Once their eggs are laid these fish become very protective and will attack anyone or anything that comes near to their egg masses. Be very careful when photographing these eggs. Living things under the sea seem so much more colorful than those on dry land. It's really rather remarkable how much we miss, but I think the environment seems so very hostile to so many sea creatures. And have also received a 0.54 percent upvote. 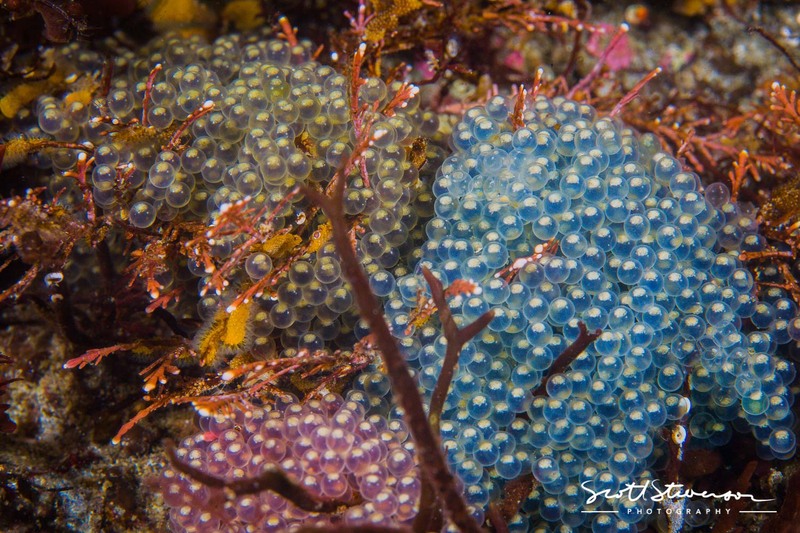 I believe that the most impressive colors and forms of nature are found in the ocean, and the Kelp Greenlings and their eggs are a sample of that. What a special curiosity nature brings us and to study it is to express how much you love the earth and its mysteries, thank you for sharing. That is incredible! I wish I could see of the stuff you photograph in person! Thanks @scottdphoto.